The Science of Complex Systems is an emergent discipline rather successful in the last years. However, further progress in the physics is hampered by the lack of deep knowledge about how multi-level complex systems organize and operate. Preliminary results show that interactions at different levels behave in a significantly different way than in an isolated level. For example, such dependencies may induce cascading failures and sudden collapses of the entire system. This makes the science of complex networks particularly suitable for the exploration of the many challenges that we face today, including critical infrastructures and communication systems, as well as techno-social and socioeconomic networks. We have been working in the development of a mathematical, computational and algorithmic framework for the study of the physics of multiscale complex systems. 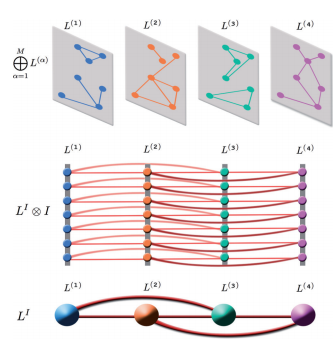 The chosen framework consists in a set of layers in such a way that every single layer has exactly the same set of nodes, but they can have different patterns of connectivity. A clear example can be that of social networks, where a layer can be a set of Twitter users having its respective set of following and followed users and another layer can be the same set of Facebook users. A user can have different sets of neighbours in each network because one can think on more familiar or more professional links. But the set of users is exactly the same. In this case, one can imagine that information can flow in any of the two layers and dhifting from one to the other when one of the users decide to do it.